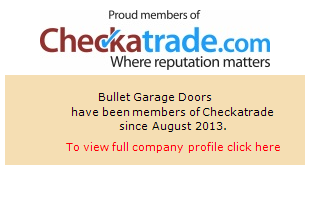 Bullet Garage Doors are here for all of your garage door-related needs. We have a long history of supplying customers in and nearby the Watford area with our services; we both install garage doors and carry out important garage door repairs. We have over fifteen years of experience in the industry, and are thus extremely confident that you will be satisfied with the service we provide. Our reputation is outstanding, and you can read some of our customers’ reviews to hear about their experiences. We’ve also got a great Checkatrade profile, which would be worth taking a look at if you’re looking for more reassurance. We offer a range of different garage doors, from canopy style to sectional doors. All of our staff members are fully trained to provide you with a sturdy garage door. Staff members will advise you as to how much the garage door is going to cost you at the earliest opportunity, allowing you to assess the various options available to you. All of our garage door installations come with a 12-month guarantee, providing you with invaluable reassurance. The garage door repairs we offer are also carried out by our fully-trained, professional team. An initial consultation will be conducted, and our workers will always be more than happy to discuss potential costs before carrying out the necessary work. Bullet Garage Doors will never attempt to hide any costs from you, and will keep you in the loop throughout the process. Watford is situated 20 miles from central London. For the northern Home Counties Watford is considered one of the major regional centres. Watford is home to a well-known major shopping centre, the Harlequin shopping centre, which has many branded outlets to shop at. Also Based in Hertfordshire, Watford is famous for its coliseum and football club. We’re based in Dunstable, which is around 25 minutes away from Watford. That means that if you need to call in and see us, or we need to come back out to visit you, we’re never far away. If you have any queries and questions then please do not hesitate to get in contact with us to discuss things further. You can call us to book an appointment with us to come and see what your requirements are whether it is an installation job or a garage door repairs job we are happy to help. Please fill in the contact form on the contact page or call us directly on 01582 932025. Removed an old pair of glazed wooden doors and frame and fitted a new pair of bennington doors unglazed complete with heavy duty hinges and night latch and new timber frame.